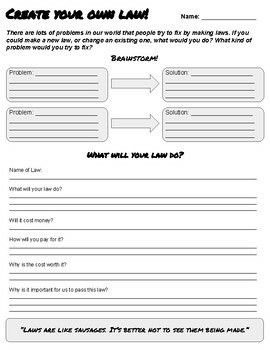 Using this easy worksheet, students can design and create their own law. On one simple page, students are directed through a brainstorm activity (where they consider problems in the world, and how to potentially fix them with a new law), and deep-level questions surrounding their new law (such as how it will be funded and enforced). This worksheet can be adapted for use in multiple topics. U.S. History students can use it as part of a Constitutional Convention exercise, or American Government students can use is at part of a Model Congress. Even other subject areas can make effective use of this worksheet, such as an English Language Arts class using this alongside the courtroom scene in "To Kill a Mockingbird," or biology/ecology students using this to create new environmentally-based laws. The possibilities with this worksheet are truly endless, and I hope that it propels some deep-level discussions in your own class!